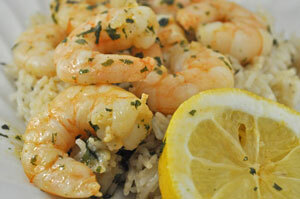 Shrimp with Lemon and Garlic, Thyme for Cooking easy gourmet dinner. A salute to garlic! There's a lot of garlic in this meal - but it's Friday and garlic is good for us. It's all cooked so the flavor is mild. The smell of garlic slowly cooking in butter is only improved by the addition of shrimp, lemon and parsley. You could substitute 1 tbs of olive oil for 1 tbs of the butter if you wish - or use all olive oil. But we don't (usually) eat a lot of butter, so we indulge in this recipe. Cut lemon in half and cut off 2 slices for garnish. Squeeze the remaining lemon for juice. Melt butter in a nonstick skillet over medium-low heat. 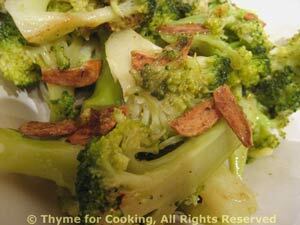 Add garlic and sauté until golden and tender, 5 - 7 minutes. Turn heat up to medium and add shrimp. Sauté until shrimp start to curl and turn opaque. Add lemon juice, parsley and heat through. Add stock, thyme and lemon juice. Cover and cook for length of time on package. Spoon shrimp and sauce on rice, garnish with lemon slices and serve.